What is Auriculotherapy and Auricular Medicine? Auriculotherapy is a non-invasive form of focused stimulation to the outer ear that reflexively connects to specific areas of the brain which in turn attempts to normalize body functions, reduce pain, and diminish addictive cravings. While the original basis of auriculotherapy may be lost in antiquity, investigations by the late Dr. Paul Nogier and associates working mainly in France and Germany have developed this technique into an advanced, modern healing art and science. In the 1950's and 60's Dr. Nogier noticed that some of his patients had a small scar on their ear that they claimed helped them reduce their painful sciatica (back and leg pain) symptoms. He subsequently mapped other apparent connections between the ear and body developing the somatic reflex map of the ear that practitioners have become familiar with. In another major contribution to this new expanding field, Dr. Nogier also recognized that one could use a careful monitoring of the pulse, itself an expression of the autonomic nervous system, to tap into the body's interaction with its immediate intrinsic and external environmental influences. That is to say that it is possible via the pulse, to measure the body's response or reaction to extremal stimuli, both good and bad, and determine a course and sequence of therapeutic interventions beneficial to the health of that person. Nogier named this signal that he could detect through the pulse, the vascular autonomic signal (VAS). The fact of these reflex connections between the body and the ear has been confirmed by fMRI studies and the experience of thousands of medical doctors in their daily practice. Also a method of action has been identified by studies that show a near immediate release or change in neurotransmitters in the brain (endorphins, dopamine, etc.) which helps explain why auriculotherapy has been so useful in the treatment of addictions (eg. smoking cessation), emotional states and similar conditions. What is the Difference between Auriculotherapy and Auricular Medicine? Auriculotherapy is the simple technique of stimulating the external ear for the purpose of producing reflexive actions by the brain that help correct various dysfunctions or injuries in the body. 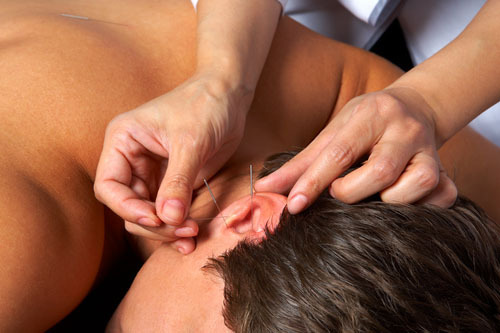 Specialized acupuncture needles are commonly applied to the external parts of the ear, but it is often just as effective to use low level laser light, very mild electrical probes, or straight mechanical pressure to do the stimulation. Auriculotherapy becomes Auricular Medicine when one starts to use the VAS to conduct a more detailed diagnostic interrogation of the patient's body to apply a more rigorous and nuanced treatment protocol. These techniques may also be called auricular acupuncture. See the auricular medicine article under my 'news' tab for an excellent history of auricular medicine by Dr. Bahr. Yes. This is a young and growing field and there have been inevitable splits of opinion and practicalities. In China, Nogier's work was enthusiastically received though slightly modified according to their own thinking and experience. In the Chinese practical application it is often considered a part of acupuncture, but strictly speaking it is a reflex therapy and does not depend on the theory of energy circulating in 'meridians' as acupuncture does. In North America, Auricular Medicine seems to be rarefied knowledge, although the Auriculotherapy Certification Institute is diligently trying to educate practitioners in auriculotherapy, and a medical doctor working in New York city has come to the fore with his auriculotherapy treatment protocol of street addicts (NADA protocol). In Europe there are tens of thousands of medical doctors using the French and German variants of Auricular Medicine in daily practice. After due consideration and comparison, I have come to firmly embrace the German interpretation and protocols of Auricular Medicine. I like the rigor and opportunity for self check and correction this method offers.